Rome had The Colosseum. I guess America is stuck with a lousy frig. Can you imagine getting up on the middle of the night for a snack?? Betcha this would break you of the habit. 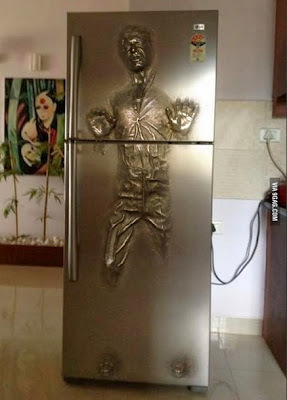 Perfect for diehard Star Wars fans. Noooo thank ya. Wouldn't wanna have this in my face for one minute. Umm, why? No thank you. Not even if someone gave it to me... for free. Sorry, but I think whoever came up with that one will be flying Solo on his way back to the drawing board. ...or else going to be possessed of just a little too much common sense to throw money away on it. HAHAHAHAHA!!!! I was thinking the same thing. At first, COOL! Then NO WAY: CREEPY! lol It's awesome and weird at the same time. Have your husband hide call your best friend and show them the fridge. Then ask if they will help you get rid of the body. It's not a real fridge. It's a photo shop image created by Quentin Devine. I like it, however my eldest daughter is a HUGE Star Wars nerd. I would not buy the fridge, but maybe spend a few bucks on a vinyl peel off if they made one. She'd get a huge kick out of that!